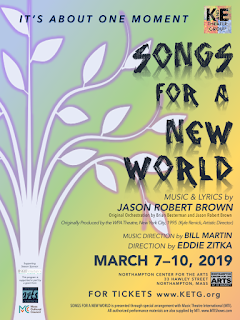 Tony Award-winner Jason Robert Brown explores life’s emotions through music in Songs for a New World presented by the K and E Theater Group, March 7 – 10, 2019, at Northampton Center for the Arts in Northampton, Massachusetts. 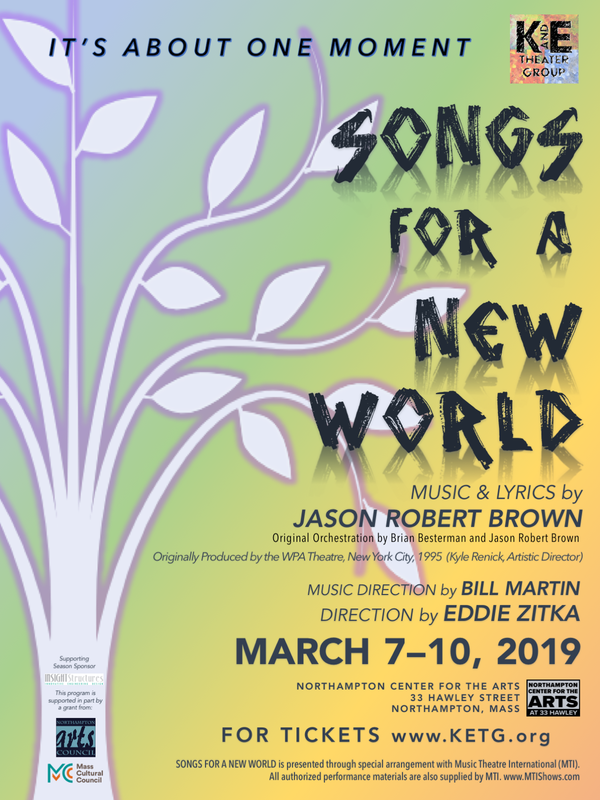 NORTHAMPTON, MA – Western Massachusetts’ bold, new theater company, K and E Theater Group (KETG) presents Tony Award Winner Jason Robert Brown’s first musical, Songs for a New World, at Northampton Center for the Arts. The musical is presented as a collection of songs, artfully blending pop, jazz and gospel in powerful solo and ensemble numbers sweeping us into the multiple journeys that result in that “one moment” where we decide to stand our ground, take one step, and eventually find our way home. The K and E Theater Group production of Songs for a New World is directed by K and E Theater Group President and Artistic Director Eddie Zitka, who has also directed and staged various musical revues in the area, most recently KETG’s production of Sweeney Todd at Gateway City Arts last October. His performance credits include the first national tour of The Wedding Singer, Ogunquit Playhouse’s Cinderella and All Shook Up, Johnny Ringo in the Hoop Dee Doo Revue at Walt Disney World in Orlando, Florida. Bill Martin returns to KETG as the production’s music director. Ken Comia serves as producer. KETG’s season supporting sponsor is INSIGHT Structures, Inc., based in Houston, Texas. This production is supported in part by a grant from the Northampton Arts Council and the Massachusetts Cultural Council. Songs for a New World features local talents Ben Ashley, Paula Cortis, Melissa Dupont, and David Webber. All performances are at Northampton Center for the Arts, located at 33 Hawley Street in Northampton, Massachusetts. Tickets are general admission for $25.00. There is no reserved seating. Performances run from Thursday, March 7, 2019, through Sunday, March 10, 2019. Show times for Songs for a New World are 7:30 PM on Thursday, Friday and Saturday evenings. The closing performance is presented at a matinee on Sunday, March 10, 2019, beginning at 2:00 PM. Tickets and performance information for Songs for a New World are available at www.KETG.org. K and E Theater Group is a 501(c)(3) non-profit organization formed in 2017 to promote performance arts, encourage growth of the arts and our local artists, and to entertain our local community, producing thought-provoking theater. Under the direction of Co-Founder, President and Artistic Director Eddie Zitka and Co-Founder and Vice President Ken Comia, the company aspires to further the education of and provide dramatic art entertainment to the surrounding Western Massachusetts communities, actively recruiting new performers, and enriching the performers’ experiences as they interact with theatrical arts. KETG organizational support is currently provided by generous individual contributions, and supported by Board Members Paula Cortis, Paul DiProto, Melissa Dupont, Terri Gidius, and Jess Miller.